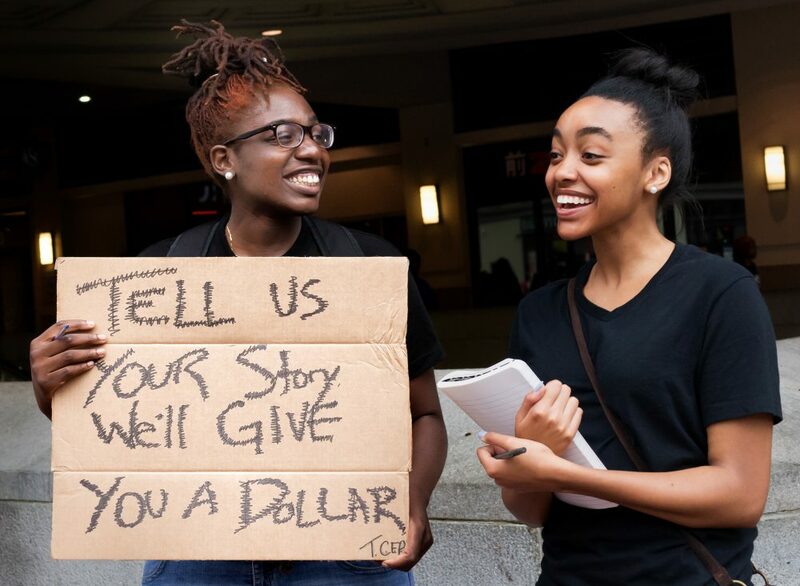 Members of the Community Engagement Project collect stories outside the Chinatown Metro in Washington, D.C. Photo courtesy of Victoria Pickering/Flickr. The dilution of meaning of engagement (and other important arts management concepts) impoverishes the industry. Each activity, properly understood and executed, holds the promise of great benefit for arts organizations. It is important to clarify, make distinctions between, and take advantage of the ways the different concepts can support and strengthen the work we do. There are two principal problems with the word engagement. The first is fuzziness about subject, object, and intent. Since engagement occurs when a person or group is involved with another person, group, or category of activity, it is important to be clear about who is involved with whom (or what) toward what end. Community engagement in the arts could refer, simply, to community members becoming involved with the arts. Incredibly, I have seen this usage. Of course, such an understanding of engagement requires little or nothing from the arts industry other than being available for people to take advantage of what they are already doing. It simply invites the “interested” in but does nothing to gain converts. The urgency around engagement, however, has to do with the need to expand our “reach”–the percentage of the population interested and participating in what the arts have to offer. So the engagement we need should have the arts organization be initiator of the activity, forming relationships with their communities. These communities would then become co-participants with the arts organization. “Arts engagement,” another common descriptor of the type of work with which I am concerned, is a use of the “E” word about which I am ambivalent. Its intent, as I understand it, is to benefit both arts organizations and members of the public by increasing the involvement of communities with the arts. The “actor” promoting engagement is, again as I understand it, the arts organization. My concern is that it could be construed as requiring people to find their way to the arts on their own. However, this is the same objection I have to an understanding of community engagement in which the community is the actor and the arts are the passive recipients of the involvement. So, in both cases the concerns need to be addressed in the implementation. A second common problem with the word engagement is confirmation bias—the tendency to understand the thing we are doing to be the good thing we believe in. Following speeches I give about community engagement in the arts, people frequently thank me for articulating things they have been feeling, often saying their organization “does not get it.” Shortly after a conversation such as this someone else from that same organization sometimes approaches me saying the work I have described is exactly what they do! They usually are viewing their organization’s audience development work as community engagement. Western University, John Labatt Visual Arts Centre, ArtLab. Photo courtesy of Ivey VA Digital Resources/Flickr. This belief that one’s organization is pursuing community engagement effectively when in fact it is primarily concerned with furthering its own interests without much investment in the community’s interests is a huge stumbling block. You can’t improve your work if you don’t believe it needs improving. It is, therefore, important to have a clear understanding of the terminology. Over the years, ArtsEngaged has developed definitions to support and differentiate among audience development, audience engagement, and community engagement. Clearly, these definitions are not industry standards but they are intended to help improve the work we do in each category. Audience development is activity undertaken by an arts organization as part of a marketing strategy. It is designed to produce immediate results that benefit the organization: sales, donations, etc. 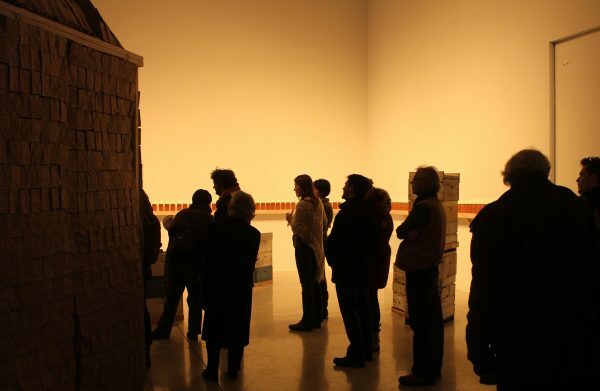 Audience engagement is activity undertaken by an arts organization, also as part of a marketing strategy, designed to deepen relationships with current stakeholders. This will, over time, improve retention, increase frequency, and expand reach through stakeholder networks. The principal beneficiary of both of these strategies is the arts organization. Community engagement, in contrast, is activity undertaken to improve the circumstances of both the arts organization and the community. It should be part of a mission strategy for the arts organization, designed to build deep relationships between the organization and the communities in which it operates. The guiding purpose is the achievement of mutual benefit. Community engagement seeks to develop trust and understanding which results, for the arts organization over the long term, in increased ticket sales and financial support as well as more arts-friendly public policy. Audience development, audience engagement, and community engagement must be critical elements of any organization’s plans. But it is effective community engagement that offers the best hope of expanding the reach of our organizations. Pre-existing relationship with identified communities (partners) built on respect. The arts industry is event-oriented, if not event-obsessed. Our principal contribution to public life is in the presentation of events. We are predisposed to “do.” There is an inbred impatience with anything that delays that doing. In community engagement work, this tendency is counter-productive. If there is no prior relationship with a community, approaching it with a completed project plan will likely be viewed as invasive or even predatory. It will be assumed that the arts organization is simply interested in selling tickets or garnering favorable publicity. In addition, without a relationship it is virtually impossible for an arts organization to know whether something it is proposing will work in or be of benefit to the community. A second common problem with the word engagement is confirmation bias—the tendency to understand the thing we are doing to be the good thing we believe in. Mutual benefit. Both the arts organization and the community must benefit from the project. Otherwise sustainability is not possible. In addition, the benefit to the community must be benefit that it identifies and recognizes. Collaborative design, implementation of programming. In any arts-community project, the artist or arts organization has expertise in the possibilities and processes of presenting the arts. The community knows what its interests are and, with respect to implementation, what can work and what cannot–e.g., when, where, and how things will be most effectively received. Existence of a relationship maintenance plan. To be clear, the relationship that is the foundation of community engagement should not be ended except in the most extreme of circumstances. Relationship building and especially relationship maintenance is central to community engagement. At the same time, it is important to understand that this part of engagement work need not be a significant resource drain. A few ideas in that regard are presented here. Engagement represents a powerful means of connecting with new communities. Unfortunately, it is often misunderstood. Clear definitions and distinctions among related terms and processes, whether they are those presented here or not, are vital for the health and sustainability of the nonprofit arts sector. In addition, clarity about effective community engagement/arts engagement practice is important to ensure that effort will not be wasted on actions that impede rather than enhance relationships with external communities. The nonprofit arts industry faces enormous demographic and economic challenges (among many others). Finding new and better ways of relating to our communities is essential for the well-being of our industry. Fully understanding and effectively practicing engagement is one of our best means of achieving a more sustainable future. Doug Borwick is past President of the Board of the Association of Arts Administration Educators, a long-time professor of arts management, and a composer. He is author of the ArtsJournal.com blog "Engaging Matters" as well as of the books, Building Communities, Not Audiences and Engage Now!, and is CEO of ArtsEngaged, providing training and consultation to artists and arts organization to help them more effectively engage with their communities.